Hello! 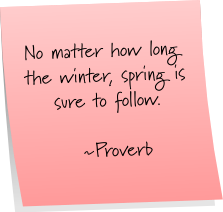 It's that time of week ~ Post It Note Tuesday ~ waiting for spring edition! Here are some of my random thoughts, musings, and quotes du jour. Enjoy. Love this, I am thinking all those things too! hahaha the first one is SO true!!!!! lord i keep thinking, 'vegas, vegas, vegas'!! My mantra is just Lilly, Lilly, Lilly!